Gears of War 4 promises to be a feast for the eyes in the PC version under Windows 10. There are 28 different setting options that allow the PC players all the freedom in the graphics options. Here, we show you the minimum and recommended system requirements in detail and will also give you what PC hardware you need to run the Gears of War 4 under optimal settings. The Gears of War 4 developers promise a highly optimized PC version to be particularly adaptable. So you can, for example, disable V-Sync and the frame rate will not be limited, the second in single player mode to 30 FPS. However, in multiplayer mode, a maximum of 60 FPS is possible. In addition to "minimum" and "recommended," there is also an ideal configuration to benefit from the high-resolution textures and detailed effects. The PC version supports any known resolution and ultra wide variations. In addition, you can look forward to 4K gaming experience. The detailed system specs you can find below. 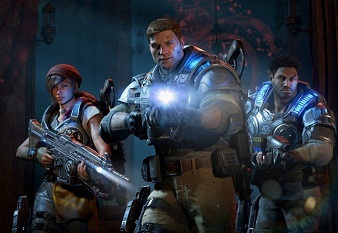 Gears of War 4 is based on a modified Unreal Engine 4, which is to take advantage of multiple CPU cores more effectively, which ultimately is the GPU with higher quality graphics and FPS rates.